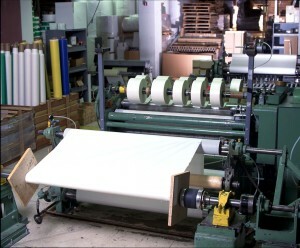 Slitting is the conversion process that cuts (or slices) wide rolls, or logs, into thinner pieces. Can-Do National Tape can slit various flexible materials and pressure sensitive adhesives to customized widths using a variety methods and machinery. Can-Do’s state-of-the-art Winding and Slitting Machines are equipped with numerically-controlled indexing to ensure that we can maintain our own high standards of quality as well as meet our customers’ specifications. Lathe slitting allows us to customize a solution that makes both the most efficient use of the material and provides the best solution for our customers. Lathe Slitting is the process of spinning a log of pressure sensitive tape (or other material) on a stationary mandrel at high speed while a circular blade cuts (slices) the material to the specified width. This “slit to width” service is appropriate for clients seeking custom width rolls of tapes or other materials. Rewind slitting affords Can-Do the ability to slit material to a tight tolerance as well as vary the length of the finished material. We own and operate several different rewind slitting machines which utilize the Score, Shear, or the Razor slitting methods for converting material. Score, Shear, and Razor-blade slitting have attributes that make it suitable for certain types of materials. The method selected to convert the material (Score, Razor, or Shear) depends completely upon the material being slit. Score slitting uses circular knives pressed against a steel cylinder or mandrel. The material is then pulled through, passing between the knives and the mandrel. Score cutting is more appropriate for materials of inconsistent thickness. One of our customers uses vinyl tape to cover the metal strips that hold drop-ceiling tiles in place. These strips are covered with black, gray, or white vinyl tape, and match the color of the ceiling tiles. The strips vary in width, so the tape must be cut to various widths. Can-Do slits rolls of these different colored vinyl tapes to 1-7/8″, 2 -1/8″, and 2- 3/8″. Also, while vinyl log rolls are typically produced in 36-yard length, the custom-slit material for this customer was “put-up” in 60-yard lengths. Because Can-Do is able to vary he length of the material on the roll, customer can apply the appropriate width material to the metal strips, with minimum changeover time. Problem: The tour bus was leaving at noon, sharp. At 9AM, one of the crew realized that someone had forgotten to order the gaffers tape that was to be used to secure wire cables to the stage floor. Solution: The customer called Can-Do, and we were able to slit multiple rolls in various colors of gaffers tape to several different widths and have them ready for delivery within the hour. One of Can-Do’s largest suppliers requested we assist them at a time when they were running at full capacity and were unable to deliver product to another one of their customers. We agreed to help. We received multiple jumbo rolls of duct tape on a daily basis. We were able to rewind/slit the material to a 2″ width and put up the rolls at a custom length for the customer. We produced thousands of these rolls. We were also able to custom package and shrink-wrap each roll to the customer’s specifications. In this case, we were paid a fee for each roll produced, while our client took the credit for the job. Can-Do serves as a stocking distributor for another highly regarded manufacturer of adhesive products. In this capacity, we maintain inventory of a variety of the company’s products in jumbo roll form. When we get the word from them, we convert, package, and ship their orders from our facility. We service customers for these products and provide short lead times for both custom cut rolls and small quantity orders of this material.